The new Viega PEX Press Polymer fitting system is designed to provide a 40% increased flow rate compared to the US standard PEX insert fitting. 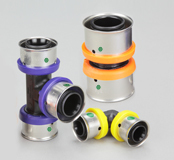 Viega PEX Press Polymer fittings also feature the innovative Smart Connect feature which helps installers easily identify unpressed connections. Viega PEX Press Polymer fittings are made in McPherson Kansas. Ranging in size from 3/8" to 1", the PEX Press Polymer fittings are molded from Radel R in a wide assortment of configurations to suit nearly any potable water application.